Alongside the exhibition All I Know Is What’s On The Internet, we present artist Sam Lavigne’s project The Infinite Campaign on the Media Wall. 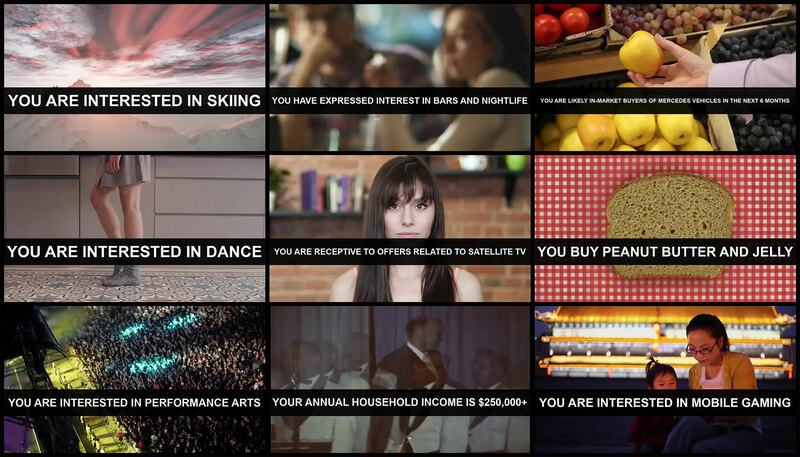 The work, originally created in 2017, utilises the user segmentation that social networks have created for the purpose of data profiling and advertising, to describe how consumer identities become industrialised, and the hyper-specific categorisations by which people are increasingly sold products. Lavigne downloaded the “interests” and “behaviours” groups that advertisers on Twitter are given to target users by. The “interest” categories are derived from user activity within the network; Twitter automatically analyses who you follow, what you tweet about and what you like. The “behaviour” categories rely on information gathered from external organisations like Datalogix, IXI, TransUnion, Epsilon and Acxiom; data-brokerage services that track your online activity outside Twitter, as well as your offline real-world activities. By linking internal and external sources — a practice known as “data onboarding” — Twitter is then able to tag its users with categories provided by the data brokers. Using this list, Lavigne wrote a script that automatically generates and posts an infinite series of video ad campaigns. Overlaid on top of automatically selected stock image footage, the script randomly produces statements in a second person voice out of two ‘behaviour’ categories and one ‘interest’ category. The recent shutting down of Cambridge Analytica revealed the secretive business practices of social media datamining and the micro-targeting of interest groups to manipulate, sell or influence decisions. This example of massive collection of internet users’ data (the company acknowledged that their tools held 5000 data points on 200 million adult Americans) indicates the value of consumer identities and how they have become industrialised, creating even more specific categories by which we are exposed to and sold products. In this context, Lavigne’s work touches upon the extensiveness of these processes and brings forward questions around the efficacy and ethics of these practices; and ultimately prompts us to consider how much the internet really knows about us. Sam Lavigne is an artist and educator whose work deals with data, surveillance, policing, natural language processing, and automation. He has exhibited work at Lincoln Center, SFMOMA, Pioneer Works, DIS, Ars Electronica, The New Museum, the Smithsonian American Art Museum, and his work has been covered in the New Yorker, the Washington Post, the Guardian, Motherboard, Wired, the Atlantic, Forbes, NPR, the San Francisco Chronicle, the World Almanac, the Ellen DeGeneres Show and elsewhere.